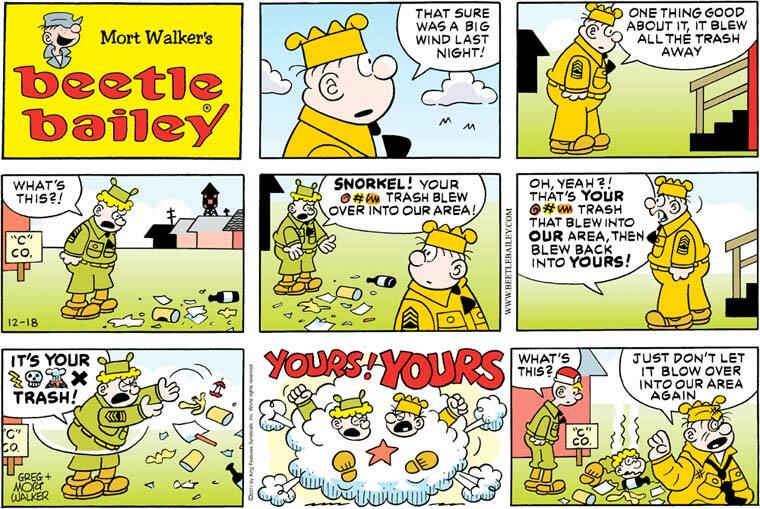 Just beneath the corny wackiness of Beetle Bailey is of course a constant undercurrent of brutal violence, but I’ve never seen it quite so explicit as it is today. We see Camp Swampy as a set of mutually hostile fiefdoms, whose simmering resentment towards each other could escalate to open carnage based on the most minor of disputes, with little that the camp commanders can do to restrain their nominal underlings. The final panel is particularly harrowing: Sarge, still so keyed up that he probably can’t even feel those visible bruises yet, stalking off wide-eyed from the mangled corpse of his rival, which he’s left among the strewn garbage and its stink lines. Normally I shave off the Pluggers Sunday title panel so that you can get a better look at the actual comic itself (to punish you, I guess?) but today I wanted you to see the trio of plugger-spawn smiling at you from above the strip’s logo. Despite their genetic abnormalities, pluggers have managed to reproduce, which means there will be another generation of this comic, despite your fondest hopes! On the bright side, these young pluggers would rather sit dully on their couch diddling with computer whatsits than learn the basics of becoming a guerilla army.